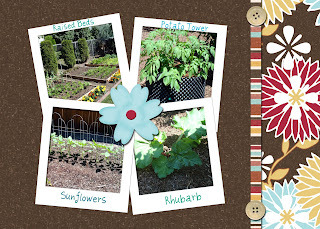 Squash House Quilts: Around the Blocks & Veg Report Week 7! I thought I would start this post off with a view of my completed Winter Wonderland blocks. Already I've begun re-making a few of them...I think putting them all together in one spot is a good way to see what needs to be "orphaned" and replaced! Summer finally arrived here! Today's high was near 90 and the next 5 days promise to be more of the same, give or take a few degrees! Below are this week's vegetable photos - week 7 already! I moved the peppers over to the beans and peas bed as the nasturtiums were taking over! Other than that, the lettuce is growing like crazy - we've had lots of great salads, lately; the carrots are showing great promise, and I've re-planted radishes (we've already eaten the first batch), which is why you see a large bare spot in the middle bed! There has been a lot of "other" activity in the backyard this week, which is why I haven't posted for a while. In the next day or two I'll show you what I mean! Also, I'm going to spread the Veggie Reports out a bit now - perhaps every two weeks or so! Thanks for stopping by! Winter Wonderland is beautiful! Rhubarb??? YUM. I just made a strawbery/rhubarb crumble--delicious but I know homegrown is best. Speaking of rhubarb--are you supposed to peel it like celery or just wash and use? What fun you'll have with those blocks...a real treasure! Should make for a dazzling quilt! Fresh veggies...aren't they great?!!! The blocks are fabulous! Great garden. Gorgeous Winter Wonderland blocks, and oh my gosh what an amazing looking garden you have. We planted peas this year only to find out that there were too many chemicals in the town water. So now we have cucumbers and tomatoes, both of which I eat a lot of. I love the blocks and the garden pics...how did you do that? Is it a picture of a photo album page or did you do it with the computer? I have photo shop elements and know it is possible to do collages with it, but I need to play with it more. Sounds like your garden is growing like mine...FINALLY! Unfortunately so are the weeds! I LOVE your blocks!! Is it a pattern in a book or something you've joined online? Oh, I' jealous of your garden too! Love that photo collage! How fun! Hmm...you lead me to believe something is being built in the garden? Blocks are looking good from here!! Your blocks look very nice in those red and cream colours. The vegtables seem to make great progress every week (unlike mine). I love love love Winter Wonderland. I don't see any blocks that should be orphaned! The potato tower is really taking off. I wish my garden still looked as lush and green as it did in April and May. But the heat is starting to get to things. We have had 90 degrees plus for 2 weeks now and looks like that is all there is from now on. And no rain in over 10 days. But that's what it is like here in the South. Yours looks amazing still. Enjoy the veges while you can. Everything in the garden is looking great! I love the red and white, looking forward to seeing what you end up with. Love love the quilt. It is turning out so well. I am super jealous of your garden. Fresh food is the best. When I first saw the blocks put together, I thought winter! I scrolled back to the top of your post and saw the name. Wow! It will be a beautiful quilt. Can't wait to see it finished.